Home Video Studio: Today's Tip: How to photograph Fireworks! 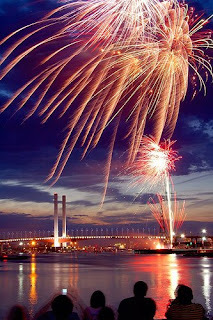 Today's Tip: How to photograph Fireworks! 1. Use a tripod to hold still (consider using a timer to decrease movement when pressing the trigger) 2. No flash! 3. Use your camera's night mode or set your ISO to 100 or lower. 4. Use f/8 to f/16 since fireworks produce their own light. Submit your best firework's photos! *photographer's photos to follow after the holiday. Happy 4th of July!